I am an example of the “typical” American parent. Fully aware of the research on television, I still allow my child to watch a show so that I can get other things done. In fact, when he was an infant I often watched television while he nursed. But I am learning as I go, and I get stronger every day. As evidenced by the following conversation. Little Dude: Mom, can I watch a show while you work on your computer? Me: You can watch one episode. Let me set a timer. Little Dude: Mom, are you done working? Me: No, I have to finish this review. Can you play quietly? Little Dude: If you are on your computer I should be able to watch t.v. You see dear reader, I had no good response to this. My son is seven years old and he was able to back me into a corner. He did play in his room for a bit after our exchange. But then I had to get off my computer and spend some time with him. I consider myself fortunate that my work is semi-flexible and I can do this. What about the parents who don’t know about the impact of media on our children? How do they make their way through this complex issue? In her new book, due January 8th, Naomi Schaefer Riley gives us some insight about the role of technology in the lives of our children. I actually have no problem with restaurants and other entertaining spaces being child-free. Modern parents often want to take their children out to fine dining establishments or live music events. While I agree that exposing kids to culture is important, I have seen many of these children playing on an Ipad or phone while in attendance. Feel free to get angry at me about this. The author and I are in agreement here. For many parents, there is a sense of guilt because we do not always know how to “play” with our children. I have felt this guilt, personally. We can only get on the floor and build Legos or play with dolls for so long before our body aches. When we get bored with playing, we feel slightly less guilty giving them a device if we can tell ourselves it is educational. Look at the educational gaming industry and the proliferation of paid online “learning” programs and you see proof of this. Personally, I have no problem with my son playing a game for a limited amount of time. But I do not think that any game will qualify him for Mensa. According to Riley, “touchscreen and button activities are inhibiting them intellectually and socially.” She states this is because real-life outcomes are not as predictable as that of games. Put simply, do not fall into the trap of believing an educational game is going to educate your child about life. In the age of school shootings and helicopter parenting we feel the need to be constantly connected to our children. I will admit that during the day I am constantly wondering what my son is doing. Parents buy phones so they can keep track of sports practices, music lessons and other activities their children are enrolled in. This makes sense to a degree. But like Riley, I am not buying my son a phone. Not in 3rd grade and probably not even in high school. When we are constantly on our phones, we are not modeling these interpersonal skills. And when are children are constantly on their phones, they never learn to be alone. Connect with your children over dinner, or have conversations in the car. Do whatever works for your family. Buying them a phone is not connection. The author gives helpful hints for cutting back on technology throughout the book. Thank goodness, because as I read I found myself feeling less and less sure about how to wean my child off of the devices I do allow. Riley also advises against kids having computers in their bedroom that are unmonitored. I completely agree with this. If you are purchasing a computer, keep it in a common area of your home. Later in the book the author describes one family who completely removed technology from their home, including phones. While this is admirable, many parents have careers that require them to be available. This is why I say do what you can, when you can. Not every suggestion in this book will work for everyone. Every parent wants to be a good parent. I will go out on a limb here and say that most** parents are aware that television is not good for young children. We often rely on Ipads and phones so that we can have a quiet moment away from our children. This does not make us bad parents, it makes us human. Naomi Shaefer Riley is a gifted writer. Her research skills are amazing, just check out the references in the back of her book! All of the research done over the last twenty years has proven that technology in all of its forms, is impacting our children. If you are struggling to make decisions about how much and what type of media to allow your children access, this book is for you. If you are concerned that your child’s school is using more computer games than direct instruction, this book will be a great reference for you to use when you speak to school administrators about your concerns. Read Naomi Schaefer Riley’s book, and learn as much as you can about the technology your children are using and asking for. Make decisions that you can stick with. And don’t feel guilty! You are the parent, so go BE the parent. 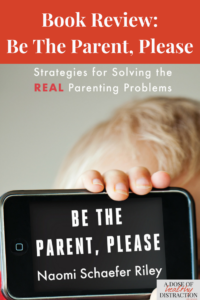 Be the parent please, is available for preorder on Amazon. I was given a copy of this book for review. Please see my complete disclosure here.